You can see the computer age everywhere but in the productivity statistics.” Today, we could repeat this celebrated 1987 statement by Robert Solow, Nobel laureate founder of modern growth theory, with the substitution of “technology” for “computer”. We live in an age judged to be one of exciting technological change, but our national accounts tell us that productivity is almost stagnant. Is the slowdown or the innovation an illusion? If not, what might explain the puzzle? The slowdown, if true, matters. As Paul Krugman, also a Nobel laureate, argued, “Productivity isn’t everything, but in the long run it is almost everything.” Improvements in standards of living depend almost entirely on rising output per worker. The productivity slowdown is a major explanation for the stagnation in real incomes and the pressure for fiscal austerity in high-income countries. Gene Grossman of Princeton and three co-authors even argue that the marked slowdown in the growth of incomes per head also explains the decline in labour’s share of national income in wealthy countries. No economist has done more to promote the revolutionary implications of information technology than MIT’s Erik Brynjolfsson, above all in books co-authored with Andrew McAfee, also of MIT. But, in an interesting recent paper with two co-authors, he, too, recognises the “productivity paradox”. The paper does not resile from a belief in the transformative power of recent technological advances, particularly artificial intelligence. On the contrary, it emphasises it, notably in image recognition and translation. Yet the productivity slowdown, the paper admits, is real. This seems to reflect weak investment and, above all, declining growth of “total factor productivity”, a measure of output per input of capital and (quality-adjusted) labour. TFP is a measure of innovation, of the ability to produce more valuable output with given quantities of inputs. Without innovation, the rising prosperity of the past two centuries would have been impossible. In truth, innovation, not productivity, is almost everything. One possible explanation is mismeasurement. It is, and always has been, difficult to measure the impact of new technologies, particularly now when many services are free and many are provided, invisibly, from outside the US. Yet it is hard to accept that measurement suddenly became more difficult in 2005, when the US productivity slowdown began. Moreover, even when account is taken of likely mismeasurement, in a study by David Byrne of the Federal Reserve and Dan Sichel of Wellesley College, the result is to raise TFP growth in the tech sector, but lower it elsewhere, with negligible effects on the whole economy. Mismeasurement then is not the explanation. A second possibility is that diminished competition and expensive rent capture have dissipated the potential gains. So we have islands of innovation and huge wealth, but a weak economy. Several researchers do argue on these lines. This may even be a partial explanation. But it would be astonishing if monopoly alone prevented innovative technologies from bringing productivity benefits to today’s open economies. A third possibility is that the new technologies are simply not what they are claimed to be, particularly compared with the wide range of transformative ones from the late 19th and early 20th centuries: clean water, electricity, the internal combustion engine, powered flight, petroleum and chemicals. We take all those for granted, but they changed everything, as recent technologies may have not. Artificial intelligence may be a revolutionary general purpose technology but, a century ago, several technologies arrived at much the same time. A complementary view is that progress is harder now: it takes more researchers to advance technology than it used to do (though we can also employ more researchers today). The final possibility — and the one that the paper by Mr Brynjolfsson and his co-authors unsurprisingly believes — is that this is the lull before a storm. It argues that the same productivity pause happened with electricity in the 1920s. It takes time for a new GPT to transform an economy. Today, AI is in its earliest stages. Soon, they argue, it will change everything. This is consistent with the finding of Profs Crafts and Mills that past productivity performance is a poor forecaster of future performance. When I look at the weighty presence in the modern economy of labour-intensive service sectors, such as health, education and care of children and the elderly, I conclude that the technological transformation will be slow. If I am wrong, it will be disruptive. At the moment, however, we have the worst of both worlds: significant disruption but near stagnation in average incomes. What it will be in future — slow or disruptive — we do not yet know. But our societies are built on an implicit promise of growth. If the choice were between no progress and disruptive advance, we must hope for the latter — and do our best to manage the consequences. The retail industry is undergoing a major repositioning as legacy stores and brands that were once customer favorites fall victim to shifting consumer demands. Nine West, Toys R Us, Claire’s, Macy’s, Aerosoles, BCBG, Payless and countless others have either filed for bankruptcy, closed hundreds of stores or simply pulled the plug on the whole operation. In her new book, The Shopping Revolution: How Successful Retailers Win Customers in an Era of Endless Disruption, Wharton marketing professor Barbara Kahn explains how retailers can weather these radical changes. Kahn joined Knowledge@Wharton to explain why in today’s retail environment, it takes more than a great sale to keep customers coming back for more. Barbara Kahn: The interesting thing about Amazon is that they have, as they call it, a maniacal focus on the consumer. If you look at retailers in the past, the customer was not part of the proposition. Amazon understood that the customer experience really matters. Knowledge@Wharton: Walmart is also a huge player here. In what ways does Walmart need to copy Amazon, and in what ways should it follow its own path? Kahn: Walmart disrupted the retail industry in the mid-1990s. I wrote a book about it then. It was called Grocery Revolution. What Walmart did was an operationally excellent strategy at the time: They evened out demand, got rid of high-low pricing and went to everyday low pricing. They understood that customers want low prices, and they really attacked it from an operational point of view. But what Amazon showed was that it’s not just about price, although price clearly matters to a certain segment of consumers. But it’s also about convenience. Frictionless. Make it easy. Walmart hadn’t done that before. In response to the competition, or the competitive expectations that Amazon has imposed on the industry, Walmart has to make their world more frictionless. And they have to embrace online shopping and e-commerce in a way that they hadn’t previously. Knowledge@Wharton: In the book, you share a framework for helping to make sense of all these changes in retail. What are some of the key elements of the framework? Kahn: I did a lot of research, and I’ve been studying the industry for a while. [In the book,] there is a description of some of the different research, but it’s important to lay it on a framework and to think about the strategic implications. That’s what I think the value of the book is. So, it’s a very simple framework. It’s deceptively simple, but it has really strong implications. I start with two basic principles. The first is the principle of customer value. In the retail world, it means that customers want to buy something they value from someone they trust. That forms the columns of my matrix — product experience and customer experience. The second principle is the principle of differential advantage. They want to buy from retailers who do it better than anybody else. How can a retailer do it better? They can either give more pleasure or take away pain. That provides the rows of the matrix. Therefore, in my matrix, I have a two by two. On the top row, which is benefits or pleasure, the product quadrant would be things like brand or luxury or design or technology or something that’s really super-cool about a product that you’re willing to pay a premium price or even a luxury price. It’s the importance of in-store touch and feel. That quadrant would be retailers like Sephora or Eataly, which provide incredible, state-of-the-art customer experiences in the store. Copyright Barbara E. Kahn. Published by Permission of Wharton Digital Press. On the second row, it’s take away pain. And on one, it’s the pain of the product’s price. Walmart is an example of take away pain and offer low price. Walmart, Costco, TJ Maxx would be in that quadrant. Take away the pain from the customer experience is what Amazon did really differently, and they made it convenient. They made it frictionless. In Amazon’s case, their differential advantage is collecting a lot of customer data so that they can constantly simplify and personalize and customize the experience to make it easier and easier for the customer. That’s the matrix. That’s how I can define things. But the strategic implications of the matrix are something else. Knowledge@Wharton: You noted in the book that it used to be good enough to just be good at one of those things. But now, you need to be good at more than one of those things. Is that one of the implications? Kahn: Yeah. That’s something that I discovered when I was trying to map these different strategies on the matrix. In a lot of marketing strategy frameworks, it’s, “Be the best at something and good enough at everything else.” That’s a rubric that we’ve used strategically. But when I was looking at what was happening in retail, it’s an industry that is being disrupted. It’s very, very hyper-competitive now. If you can’t make it, you’re really going to go out of business. When I looked at the winning strategies, each one of the winning retailers were the best at something. But they leveraged that leadership advantage to be the best at something else, too. I call that the two-quadrant strategy. So, you have to be the best at two things and good enough at everything else. But if you’re in a competitive industry, if everybody’s trying to be the best at something, what that does is ratchet up customer expectations. Even when you’re trying to be just good enough at something, those expectations are constantly going up. You can see it in what Amazon’s done to the industry. Say you’re competing on price, but Amazon is making two-hour deliveries or these kinds of things that raise customers’ expectations. Just being good enough in that quadrant of frictionless or convenience is getting harder and harder to do, let alone being the best the way Amazon is. Knowledge@Wharton: Are customer expectations driving a lot of these changes? Kahn: Five years ago, you would walk to your grocery store and get groceries. You didn’t think that much of it. Now, you demand that it’s delivered to you, and it’s got to be delivered to you at this time. The reason why those customer expectations are higher is because retailers are delivering to these new values, and customers get used to it and want everybody to do it. Knowledge@Wharton: If you could pick one trend that retailers need to focus on now, what would it be? Kahn: I do think understanding the importance of customer experience is really important — understand that customers now have been catered to. They expect things to be convenient. They expect the retailer to have an online presence. There are some retailers who still don’t have an online presence, and I wonder what will happen to them. Trader Joe’s is a retailer that people just love. It’s a real niche retailer, but they don’t have much of an online presence. I wonder what will happen going forward if they don’t rectify that situation. Knowledge@Wharton: A lot of legacy retailers are suffering because they have stores and systems that are outdated. If a retailer is way behind now, how can they catch up? Kahn: I don’t know. A lot of retailers that have fallen behind just really haven’t caught up. A couple of things are driving that. One, Amazon alone has just raised people’s expectations on e-commerce. But you also see a difference in consumers. A lot has been written about millennials, but now people are focusing on Generation Z. These are what people are calling digitally native consumers. They grew up with the phone in their hand and shop through their phone. They expect online. If you don’t have a seamless shopping experience that goes across physical stores, mobile and online, these people are just going to go somewhere else. It doesn’t make sense for them. A lot of the legacy retailers understand it. I’m not saying they’re naive and don’t get the importance of e-commerce. But they have legacy systems that are hard to integrate. The online and offline have been so separate that, for some of these retailers, it’s very hard to get up to speed. That gives an advantage to the digitally native retailers who came in after expectations. They came in with an online presence, and then they started opening stores. It was much easier for them to integrate the shopping experience than the other way around. Knowledge@Wharton: All eyes tend to be on Amazon and Walmart because they are the big examples. But what are some other retailers flying under the radar that are doing things well? Kahn: A lot of attention is being payed to what are called digitally native vertical brands. [One] is [eyewear company] Warby Parker. Warby Parker is one of the big ones that started and really got the equation right. What digitally native vertical brands have in common is an amazing brand that really caters to a customer segment and really cares about what the customers want. So, they offer something of value. The other thing that characterizes these digitally native vertical brands is that they are vertical, which means that they go direct to the end-user. They can do that because they start out online and don’t need to go through physical retailers, necessarily. That eliminates layers and offers a good price. So Warby Parker, as well as Bonobos, Casper, or some of the other digital native vertical brands, offer really cool customer experience brands, but they offer it at a lower price. They compete very effectively because they have that two-quadrant leadership strategy. Knowledge@Wharton: H&M is a retailer that became successful riding this wave of fast fashion, but now it’s sitting on billions in unsold inventory. What do you think went wrong? What lessons are there for other retailers? Kahn: Zara is also a fast-fashion retailer, which I also think of as a vertical brand. It eliminated the layers, too, and offers a good brand at a low price. H&M and Zara both did that. Zara is a little higher price point than H&M but still much cheaper than luxury. What Zara did, which I don’t think H&M did as well, was it had a better prediction of inventory, of fashion taste. They were right on top of fashion and managed their inventory well. H&M had a lot of excess inventory. Once you start doing that, you’re not really on top of what customers want. Then you get a lot of costs that have to be managed. Knowledge@Wharton: A lot of luxury retailers are retooling to compete in an even more fickle fashion world. What does luxury mean now? Does it mean something different than it did 10 years ago? Kahn: Yeah. Going back to this epiphany that I had about two-quadrant strategy, luxury used to be good enough to be just fantastic brands. They didn’t have to compete on price, and they weren’t convenient. Part of the luxury paradox is that it shouldn’t be easy to get, so that makes it more valuable. That’s crazy, but that is what happens. But now, with people’s expectation of online convenience, even luxury brands, which went kicking and screaming into this notion of e-commerce, recognize that e-commerce is starting to be a factor in whether consumers will buy from you or not. You’re seeing new platforms starting up, like Net-a-Porter or Farfetch, which are e-commerce platforms trying to cater to the luxury market. Outside of the U.S., Alibaba is doing that. Most of the luxury companies or brands do not want to sell on Amazon because they don’t think that Amazon will give them enough power over their own brand. Amazon is a very ruthless retailer. But some of the other platforms are ways for these luxury brands to reach their consumers, protect their brand mystique and still offer some convenience of e-commerce. Knowledge@Wharton: This new era of retail also has implications for commercial real estate. How will developers have to change their strategy to accommodate this new world? Kahn: You’re seeing a lot of interesting changes in physical stores. A lot of the B and C malls, the less attractive malls, have been closing down. Even when you see the A malls open up, they are not the same A malls as in the past. A good example is Century City, one of the new malls that opened up in Los Angeles. It’s a gorgeous mall. I loved it. One of the anchors is Eataly, which is a food place. They have tons of restaurants. They have gyms. They have a department store. Nordstrom is there. But the statistics that I’ve seen is that a lot more of the purchases used to be made in the department stores, and that’s going way down. It’s much more experiential. People like to hang out at the malls. They eat, they go to the movies, they go to gym. There’s still some retail there, but it’s a different mix of retail. Knowledge@Wharton: Given these trends, what do you think the retail experience will be like for the consumer 10 years from now? Kahn: That’s hard to call, for sure. There are other trends. Demographically, a lot of people are moving into the city, so you’re seeing smaller-footprint stores there. I think a lot of the retail physical stores are making themselves smaller because they’re not carrying as much inventory. Some of the retail stores are becoming showrooms. You can go there to touch and feel the product, and then you order it online and it’s delivered within two hours. That suggests the store itself doesn’t have to have the inventory. I think the importance of this touch-and-feel and really valuable customer experience is going to matter. It’s not just about food. A lot of people think customer experience is to offer a cup of coffee. It’s obviously more than that. But it has to be a way where you really understand what the customers want to do in the store. The other thing that a lot of the retailers are fooling around with, and it’s very interesting to think about, is health care. 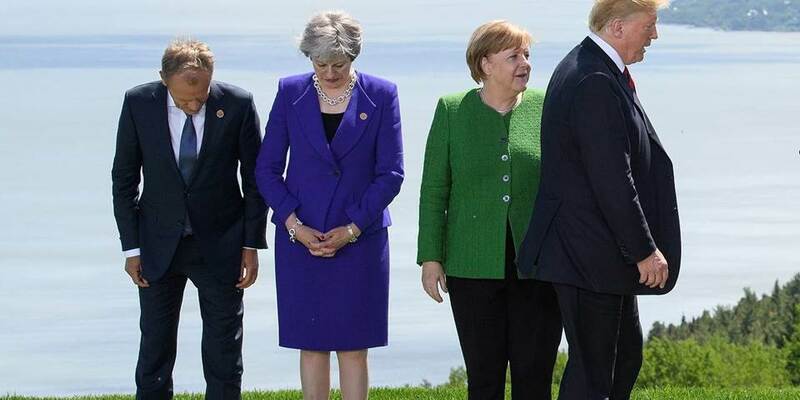 That’s also very high touch. You’re moving into CVS and Walgreens doing a lot more primary care in their stores, which is an experiential thing. You do have to see somebody to have them touch you, figure out what’s wrong with you or give you a shot. Anything that’s experiential might be in these retail stores, not just pure shopping. I think you’ll see these smaller stores, more experiential, defined very broadly. If the industry continues to be this competitive, then I think you’ll see customer expectations constantly being ratcheted up, and retailers will really have to keep improving and innovating. Knowledge@Wharton: What about the fate of big-box stores? Kahn: A lot of the closings are big-box retailers: Circuit City, Borders, Toys R Us. Those used to be called category killers. What they offered was huge assortment at low price, but online can totally defeat that. That’s just not a winning proposition anymore. The question is, can department stores exist? They’re trying. Macy’s has a lot of strategies on the table. They really understand the threat, and they’re trying to catch up. Time will tell if they can make it. Knowledge@Wharton: What are the core tenets of retail that will never change? Kahn: The irony when I developed this matrix is that, duh, this is Marketing 101: Give customers what they want and do it better than the competition. What that means is customer expectations change. It might mean something different. But really, being customer-focused I think will always be in style. 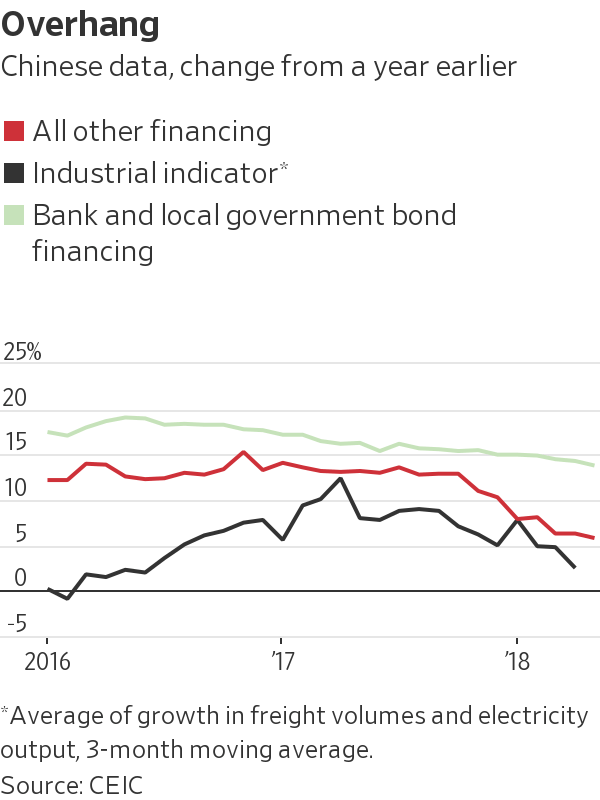 China has spent the past 18 months tightening the screws on risky funding practices, but growth has mostly kept chugging along. Total financing in the economy—including municipal and corporate bond issuance, equity sales and shadow banking—grew just 11.5% in May from a year earlier, the slowest pace in more than a decade. Even so, factory-gate price inflation accelerated again. What exactly is going on? A big factor is the convoluted way that China’s campaign against debt has unfolded—which implies that the real hit to growth could arrive soon. 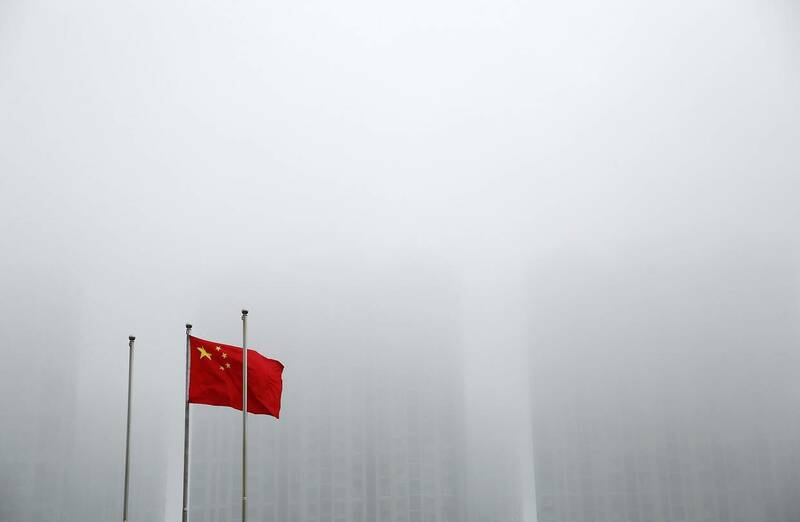 Many of the risks lurking in China boil down to two problems. The first is small banks’ heavy dependence on short-term, high-cost funding. This is the risk regulators mainly targeted in 2017: pushing bank-to-bank lending rates up and slamming the gate on sales of high-interest, short-maturity “wealth management products” to mom-and-pop investors. But the second risk—the rapid growth of corporate financing channels outside the banking system—didn’t really get addressed until late last year. Total growth in nonbank borrowing, including through shadow banks and corporate bond issuance, had barely slowed before then. It is slowing now—strip out traditional bank loans and local government bonds, and the growth in total financing was just 6% last month, less than half the level in October. That’s worrisome because small, private-sector companies—and some local state-owned ones—often have trouble getting reasonably priced bank loans in China, one reason shadow banking grew so quickly in the first place. As it happens, key industrial indicators—and the bond market—have both started signaling trouble. 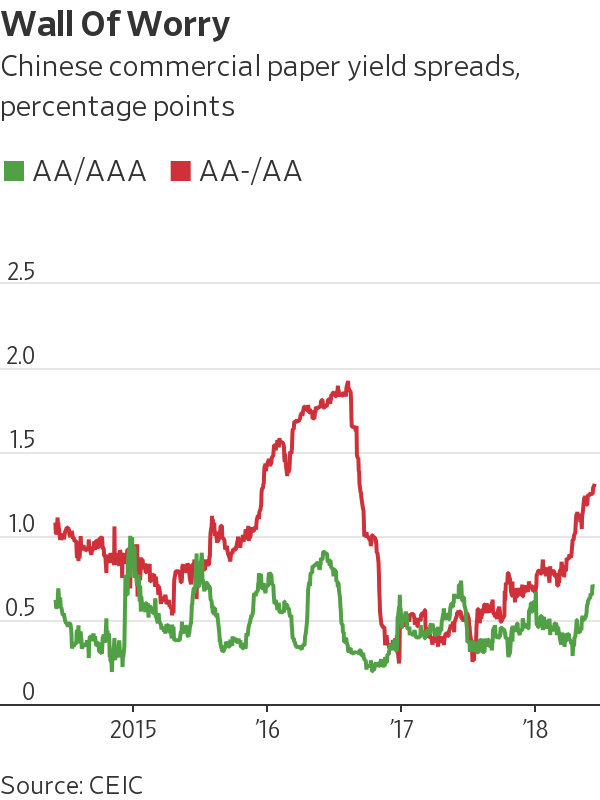 The yield premium of low-rated six-month commercial paper over AA-rated debt has widened to 1.3%, from around 0.5% for much of last year, as investor concerns about corporate funding have grown. The recent rebound in producer price inflation— which ought to help struggling companies—hasn’t settled those nerves, likely because investors believe it’s a temporary rise caused by the easing of pollution controls in place over the winter. China remains an investment-heavy economy despite progress on growing consumption over the past decade. Beijing is betting that top-down diktats telling banks to lend more to the private sector will be enough to keep the party going, as it attempts to scale back the shadow banking that has long supported companies hard up for cash. Investors will soon discover if they are right.